(03-26) 16:28 PDT SAN FRANCISCO -- Traffic on the Golden Gate Bridge remains sluggish in the aftermath of a 10-car crash that injured at least seven people this afternoon and closed the span for a time in both directions, the California Highway Patrol said. The final lane closure was lifted at 4:18 p.m., more than an hour and a half after a Volvo station wagon heading north crossed into the southbound lanes at midspan and hit another car, the CHP said. 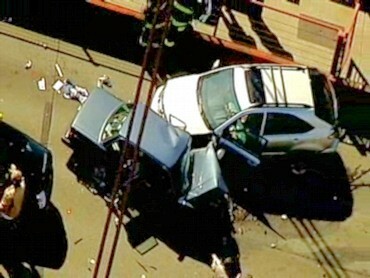 The head-on collision at 2:43 p.m. caused a series of chain-reaction crashes, CHP Officer Mary Ziegenbein said. Let's be careful out there, folks. This darling is exactly why to this day I've never once been behind the wheel of a motor car. Those horseless carriages are NOT to be trusted, Mags.